John “Johnny” OIG was said to be a Chippeway Indian.We have no record to indicate precisely when he was born, but most of the clues suggest he was probably born, approximately, around 1817. The Chipewyan Indians were a northern race, and lived a nomadic life as hunters and fishermen. Around the time that Johnny OIG was born the Chipewyan heartland was around Lake Athabasca. "The Chipewyans do not consider this part of the Country to be their legitimate soil; they come in large Bands from their own barren lands situated to the North of this lake (Lake Athabasca), extending to the Eastern extremity of Gt. Slave Lake and embracing a large Track of Country towards Churchill. The Company’s (HBC) Traders at the latter Establishment, made them acquainted with the use and value of European Commodities and being naturally of a vagrant disposition and those articles becoming necessary to their Comforts, they shook off their indolent habits, became expert Beaver hunters, and now penetrate in search of that valuable animal into the Cree and Beaver Indian hunting grounds, making a circuit easterly by Carribeau Lake; to the South by Isle a la Crosse; and westerly to the Banks of Peace River. The greater proportions of them however remain on their own barren Lands, where they procure sustenance with little exertion as the Country abounds with Rein Deer (Simpson: 1938:355-6)." Rev John WEST (1778-1845) was the first protestant clergyman to arrive in Rupert’s Land. He arrived at York Factory in 1820 and proceeded to Red River via Norway House. WEST established the first Church Missionary Society (CMS) churches and schools in Red River during his term there and travelled extensively in his missionary work (to Brandon House, Qu’Appelle, Pembina, etc). In 1823, Rev. WEST departed from Red River and returned to England (via York Factory) never to return. If Johnny OIG was indeed a Northern Chipewyan Indian, he was probably one of the little boys taken in by WEST during his last missionary trip to Churchill, overland from York Factory. Many years later, as young men, HASSALL and OIG became work-mates in the service of the clergy at Norway House. We do know that on June 24, 1827 Thomas HASSALL was baptised by Rev JONES, having attended the mission school at Red River for eight years. In 1831 HASSALL entered the service of the HBC as an Interpreter, and in 1833 he acted in that capacity on the arctic expedition of George BACK to Lake Athabasca. Unfortunately I have been unable to find any references to Johnny OIG during this period. He was a friend of HASSALL, so he too very likely received some education at Red River. He did eventually work for the HBC as a “trip-man, a canoe man”, but his terms of employment were probably only casual or temporary, and therefore may not appear in the HBC records of that period. Apparently Johnny OIG had a First Wife prior to 1840. We know very little about this first wife, or of any children they may have had. If Johnny did go to school in his younger years, perhaps she was a Red River woman. By 1840 Norway House had become the inland transshipment centre for the distribution of European trade goods from York Factory to its posts along the Hayes and Saskatchewan Rivers and to the Red River. As a boat man Johnny OIG undoubtedly became involved in the transport of these goods. 1840 is the year when the first clergymen, Rev James EVANS (1801-1846) and Rev Robert RUNDLE (1811-1896), arrived at Norway House and began to keep records of births, marriages and deaths. The first church reference to OIG that I have found so far was his 2nd marriage in 1845. It is quite possible there are other records there pertaining to his family, so it would be very nice to find out if these are available. On May 28, 1840, Rev RUNDLE performed the first baptism at Norway House. He apparently arrived two months before Rev EVANS. EVANS arrived there (from Fort Frances) in August that year with his wife and daughter and native assistants Peter JACOBS [Pahtahsega] and Henry Bird STEINHAUER. EVANS was the celebrated inventor of the Cree Syllabics, which many of our Anglican missionaries adopted (and improved) in their translation work.At the inception of the Norway House Mission James EVANS met Sir George SIMPSON, the Governor of the HBC, who received him with distinction and treated him with kindness.However, SIMPSON’s regard for EVANS would later diminish and eventually bring about his demise. Johnny OIG was an experienced traveller, and was often employed by EVANS on account of his endurance and skill. Thomas HASSEL was also a great traveller and an Interpreter. He had a gift for easily acquiring foreign languages and was able to speak fluently in English, French, Cree and Saulteaux.. He was a godly man, a genuine Christian and full of anxious zeal for the extension of the cause of Christ among his fellow countrymen. HASSEL and OIG were undoubtedly of much help to EVANS in developing his Syllabics and his remarkable translation of the Bible into the Cree language. In August of 1842 John OIG and Thomas HASSEL (both said to be young Chipewyan Indian converts) left with EVANS on a long missionary voyage to visit the Chippeway in Athabasca country. In the summer of 1843 Rev William MASON (b-c 1818) arrived at Norway House. Roger Burford Mason states: It was to be a journey fraught with difficulty and sorrow. - - On Sep 11, 1844, they were on the Churchill River, at the point where it met Pine River, far north of the Saskatchewan River. EVANS was in his tin canoe with Thomas HASSELL and John OIG. Ducks were swimming placidly in a reed bed nearby and, mindful of their need to live as far as possible off the land, EVANS reached behind himself for his gun to shoot at them. Alas, the gun went off accidentally, hitting HASSELL in the back of the head and killing him instantly. EVANS and OIG returned to Norway House and recounted the story of the terrible accident. Showing the instinctive humanity for which EVANS had always liked him; Donald ROSS (the HBC Chief Factor at Norway House) reassured him that such accidents frequently happen and that he was in no way to blame. Although OIG could vouch for what had happened, EVANS knew the Indians’ traditions. He insisted on making the hazardous journey to HASSELL’s family at their Chippeway encampment in the far north-west at Lac Isle de la Crosse, to tell them of their son’s death. This was a perilous undertaking for EVANS, not only because of the long and arduous journey involved, but because he knew that according to their traditions, the Chippeway would be entitled to kill him as to spare him. With OIG to accompany him, EVANS, setting out to find HASSELL’s family, and did so after many long and gloomy days of travel in deserted, lonely and hostile country. Eventually they were found and captured by the Chippeway Indians, taken to HASSELL’s family camp and treated roughly in the process. 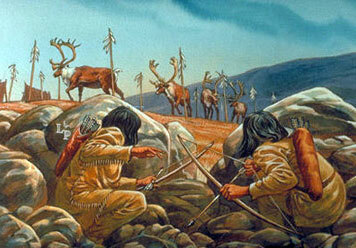 Upon hearing the story of HASSELL’s death, there was an angry movement among the Indians to kill EVANS in the process. Fortunately, HASSELL’s mother intervened and adopted him instead, in place of her lost son. - - While they were with the Chippeway Indians, EVANS and OIG took the opportunity to teach and preach, passing on to them the skills of reading and writing in their own language. The Norway House register of marriages show that on Oct 18, 1845 Johnny OIG (a boat-man) was married there (by Rev. James EVANS) to Peggy MUCHIKEKWANAPE. The final problems between EVANS and the HBC began in January, 1846, when EVANS came under suspicion for impropriety with an Indian from Rossville, Maggie MUMINAWATUM, and some girls from the missionary school (formal charges were laid against EVANS by Indians of the Rossville community). The officious and , perhaps, jealous Rev. William MASON took upon himself, as the next senior white male member of the Rossville community, to act as an investigator and judge. - - in the ‘trial’, many, both Indians and white people, spoke out for EVANS, including John OIG, who was able to give EVANS a thoroughly convincing alibi for the purported of goose-hunting camp incident. EVANS was found not guilty, but SIMPSON requested his removal and in June he was invited to England and examined by the Society’s secretaries. It was suggested that he return eventually to St Clair Mission, and not to Norway House (In November of 1846 EVANS died in England). On Sep 13, 1846 John OIG’s daughter Jane was baptized by Rev William MASON (in EVANS’ absence). Peggy must have died around 1847 because on Aug 2, 1847 (according to the Wesleyan Methodist Marriage Register at Norway House) John OIG married for a third time. Curiously, it doesn’t appear to indicate just who he married. An OIG descendant and family acquaintance indicated a marriage to Fanny HALCROW. Son Charles was born around 1860 at Norway House. In 1860 Rev George McDOUGALL (1821-1876) was appointed to Rossville, Norway House as Chairman of the Missions. In 1862 McDOUGALL (with his son John) set out to visit missions on the Saskatchewan, and in 1863 he and his family migrated to Alberta. From 1868 to 1873 Rev Egerton Ryerson YOUNG (1840-1909) was appointed to Norway House. The following narrative, written by YOUNG himself, verifies that Johnny OIG was still at Norway House during this period: The Battle of the Bears, Life in the North Land by Egerton R Young: Chapter IX: Indian Boys and Girls at School:. In winter the cold is terrible, and the Frost King reigns in despotic power, yet the children always come to the Indian Sunday school. The school is supposed to meet every Sunday morning at nine o'clock, but some of the boys and girls come to the church at seven, or even earlier. The reason why they come so early is because the church is warm and comfortable, while the wigwam habitations and other dwelling places are cold and miserable. Faithful old OIG, the church keeper, has spent most of the previous night in the church, where he has been busily engaged in keeping up roaring fires in two large stoves, that the house of the Lord may be warm and comfortable for the services which are there to be held. - - Our plain Indian church was provided with movable benches. These we had arranged every Sunday morning for the Sunday-school, then when the school was dismissed, OIG, the church keeper, and the boys, speedily rearranged the seats for the public services. In the fall of 1875 Lieutenant Governor Alexander MORRIS concluded Treaty Number Five with the Norway House peoples. The Federal government gave their preferred site at the White Mud River (now Icelandic River) to the Icelandic settlers and gave Chief David RUNDLE’s people (of Norway House) the present reserve at Fisher River. 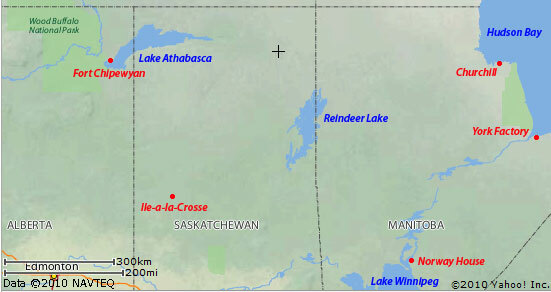 The community of Fisher River lies at the southwest point of Fisher Bay on Lake Winnipeg. As such, Fisher Bay forms a physical boundary on the east side. On the west side, the reserve is flanked by the Peguis reserve. The move to Fisher River was delayed until the summer of 1877 because smallpox broke out at the Icelandic colony just south of the proposed reserve site. When the quarantine was lifted, 43 families boarded York boats for Fisher River. The task of relocating over 200 people some 200 miles south was arduous, but successful. Throughout the 1880’s, many more families from northern Manitoba joined the original settlers. In 1888 Rev. James WOODWORTH visited the Fisher River Indian Reserve. Just before service on Sunday evening an old man named John OIG, aged 89, came into the Mission House. Was converted 48 years ago (c1840) under James EVANS. He said, "I will pray for you, I know that God will keep you in His arms. "The old man reads his Testament for practice. Among the other hymns sung we recognize, "My Heavenly Home is Bright and fair." In February of 1889 John OIG was buried at Fisher River.